Choose from optional film carriers & lenses. This unit comes equipped with PC kit and includes PC I/F cable, drivers and software for scan to PC capabilites. 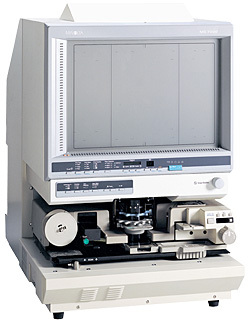 This model is designed for large format images including Engineering Drawings, maps & newspaper on microfilm. Widescreen viewing, laser printing, scanning to PC -- the MS7000 is a powerful solution for microform viewing, scanning and distribution in the digital information era. And with a big 12” x 17” screen, you’ll be able to review more information in less time. • Built-in SCSI-2 connector for PC interface, high-speed video connector for fast direct printing.